The CB71C Rugged COM Express Module is based on the AMD Ryzen Embedded family and can now be equipped with the new Ryzen™ Embedded R1000 SoC in addition to the Ryzen Embedded V1000 SoC. The new AMD Ryzen Embedded R1000 SoC features a Radeon™ Vega graphics engine with three compute units and support for up to three displays with a resolution of up to 4k without additional graphics hardware. With up to four powerful "Zen" processor cores, when using the AMD Ryzen Embedded V1000 SoC, the CB71C is also suitable for virtualization. 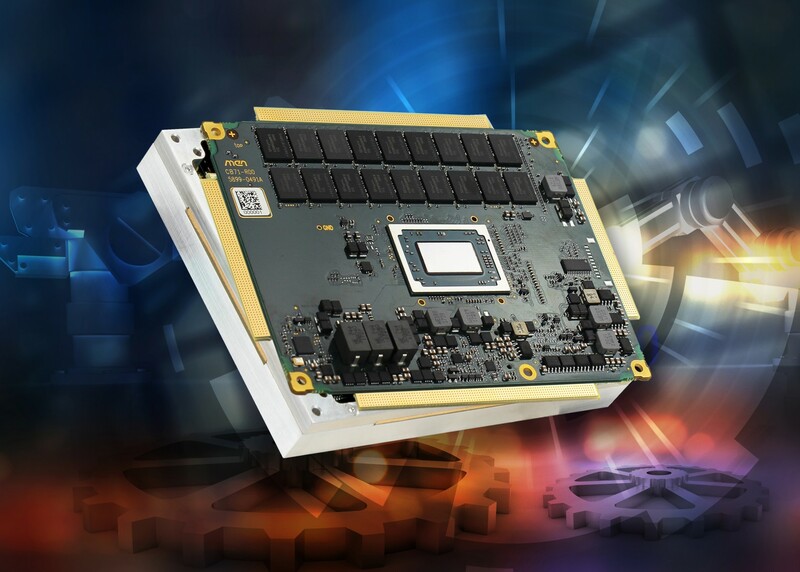 With the AMD Ryzen Embedded family, the COM module gains valuable flexibility: The design can be based on either a Ryzen Embedded R1000 dual-core SoC or a Ryzen Embedded V1000 quad-core SoC. The strength of the new AMD Ryzen Embedded R1000 SoC lies in its low power consumption combined with its high single-thread performance and high clock with dual core and quad thread performance. The modules with AMD Ryzen Embedded V1000 provide passive cooling and a temperature range from -40°C to +85°C are possible with the low-power versions. The CB71C can be equipped with up to 32 GB directly soldered DDR4 main memory and a 16 GB eMMC. PCI Express 3.0, DDI (DP, eDP, HDMI), SATA 3.0, Gigabit Ethernet and USB 3.0 are available as high-speed interfaces. The COM module has a board management controller with monitoring functions and a trusted platform module. The module also uses the Secure Memory Encryption capability in the AMD Ryzen Embedded R1000 SoC – an essential feature for security-critical applications such as payment and ticketing terminals, fleet management or monitoring.